I want to reiterate that this series of posts is for the purpose of developing an understanding of aircraft performance parameters and the factors that influence them. It is not at all about providing answers (we don’t have enough relevant information about the aircraft we’re surveying, much less how they were/are or will be employed) but it is about how to THINK about the questions in the first place. 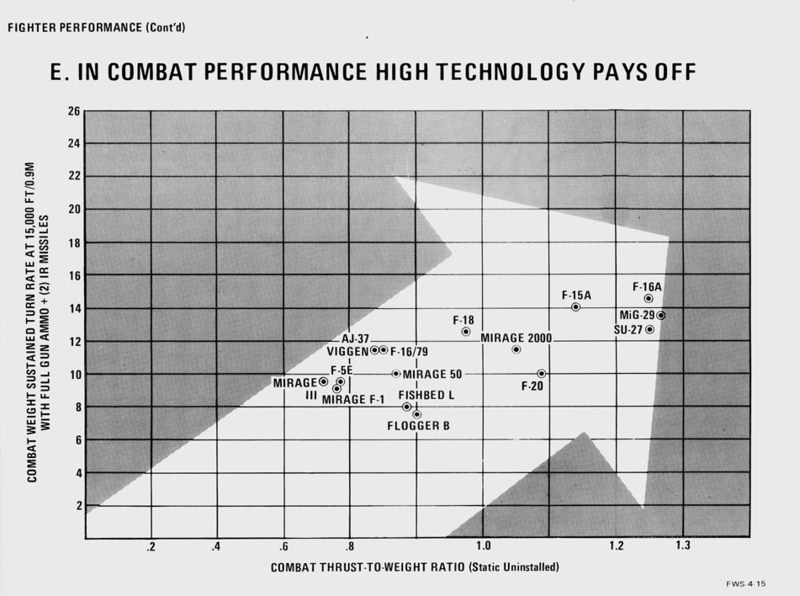 I’ve added an ‘F-18C Light’ configuration to the mix because I found enough information graphed in a General Dynamics handbook on Fighter Performance from a 1985 Fighter Weapons Symposium (FWS). The book is a recent find of mine from a used book store very near the old GD, now Lockheed Martin plant: the same Plant 4 where F-35 output is being ramped up and boutique batches of F-16s still issue forth form time to time. From what I can tell, General Dynamics hosted this event and distributed material to operational F-16 squadrons around the world for years. (G *tan Ø)/Velocity; where Ø is still, as shown in the previous post, the “bank angle”. *originally mis-typed formula for turn radius, but all rate values presented used correct formula (I checked the spreadsheets). Hazards of changing direction in middle of analyses, I guess. I presume the above is the kind of raw comparison that sets simple minds down the ‘F-35 can’t turn’ path. Don’t go there – you don’t know enough about what matters…yet. The next thing we need to do is highlight the relative importance or unimportance of the differences shown. An aircraft designed for air-to-air dogfighting must be capable of high turn rate. This parameter dѱ/dt or ѱ, will determine the outcome of the dogfight if the aircraft and pilots are evenly matched otherwise. When air-to-air missiles are in use, the first aircraft to turn towards the other aircraft enough to launch a missile will probably win. In a guns-only dogfight, the aircraft with the higher turn rate will be able to maneuver behind the other. A turn rate superiority of 2 deg/s is considered significant. *Aircraft Design: A Conceptual Approach 3rd Edition; D.P. Raymer;AIAA Education Series; 1999. I can’t find the basis for the yardstick stated by Raymer and expanded upon in the FWS handbook, but I imagine it has to do with the typical engagement segment duration where a sustained turn difference would typically yield a ‘significant’ or even ‘dominant’ advantage. 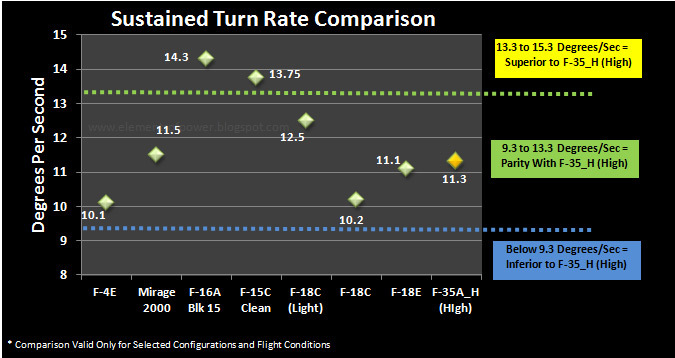 So in closing Part 2, we see that the possible range of the 'Bowman' F-35A_H's Sustained G performance is broad enough that if the actual F-35 performance is just a little better than the new Sustained G spec value, it will yield turn rates on a "par" with all but the F-15C and F-16A. If the actual performance is closer to the 'old' spec, the F-35A_H configuration we have modeled comes much closer to "parity" with our F-15C and F-16A configurations. These comparisons are rather static and one-dimensional and the relationships can change dramatically with changes to the armament and fuel carried. 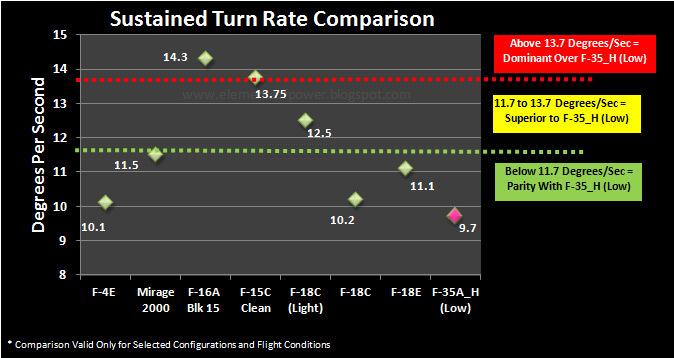 It is instructive to note the very large difference in F-18C sustained turn-rate performance based on the variation in weight (which is why I included the 'F-18C Light' data in the first place). 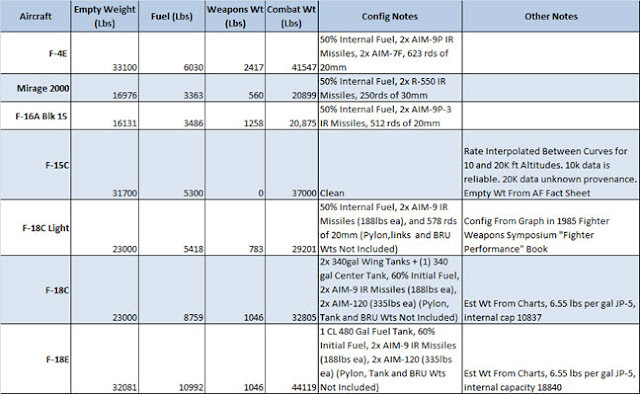 Now consider the 'Bowman Configuration' assumption of 60% fuel on board for the F-35 also means that the F-35A_H's fuel load, as a fraction of the total weight, appears to be significantly larger than any of the other aircraft we are comparing. This hints that there may be equally 'realistic' if not more realistic F-35A configurations with far higher sustained turn capability than is attainable at the 'Bowman' weights. I think it will be worthwhile (and fun) to look at things from a ‘1 v 1’ perspective with the two extremes of possible comparisons in our selected group: F-35A_H vs. the F-4E, and F-35A_H vs. the F-16A, and exploring the 'what ifs' of having slightly different configurations in our comparisons. I anticipate (but won't know until I get there) that I will be illustrating the F-4E at very light weights is not to be trifled with, and that the F-35A, when using comparable fuel weights, based upon equivalent fuel needs will be seen to have solidly 'respectable' sustained turn performance in comparison to other modern aircraft. Part 3 will look at the F-35A_H vs F-4E. So do you think the latest Sukhois do any better? IMHO they're probably more to the right on the X-axis but not any higher on the Y-axis compared to the 'old' Su-27s. I'd also like to point out your post (and the one before it) both assume even skill by the pilots. Historically (post WWII) American pilots have fared _very well_ in combat. Take a look at Vietnam. A "missile conflict" where missiles more often than not failed to fire or failed to actually hit anything. And yet, there with F4s that were terribly matched by the standards you present here, our aviators consistently came out on top. Never forget the human element. 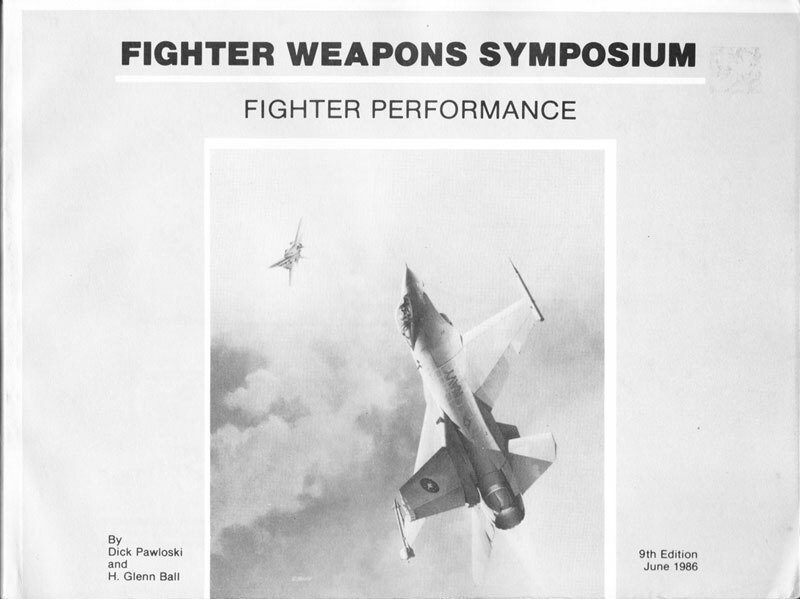 Is the fighter weapons symposium available as PDF? No PDF file, sorry. I'm scanning pages as required. From what I can tell there are several different volumes in this series that cover different topics. Later versions numbered the volumes. I've bought three 1986/87 books at my local bookstore, but there seems to be some later (1994!) volumes available online at Google books or Amazon, but I can't tell if any are the corollary to the one I'm using right now. Do you know what altitude each study was made? Altitude significantly changes G available along with rate and radius of each aircraft. Some aircraft do better at higher altitude (F-15) and some do much better on the deck (F-18). Bottom line, is the FWS numbers and the F-35 numbers based on the same altitude? Yes I'm acutely aware of the altitude factor :-). I identified it as an unknown and an assumption for the F-35A_H case, as a "Bowman configuration" 15k feet altitude assumption in Part 1. Aircraft selected for comparison were selected specifically because I had plots for 15k feet performance as well. 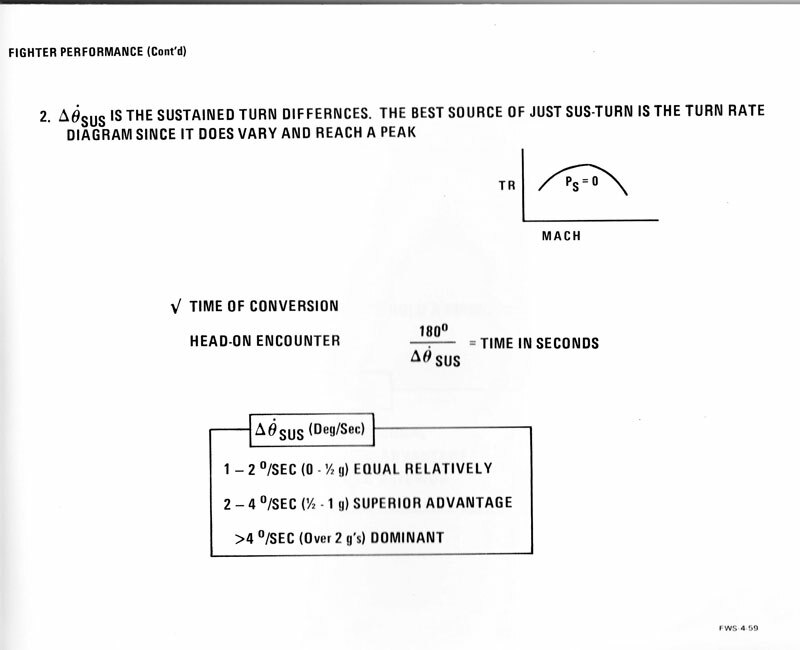 In Part 1, I specifically note that the only thing ANYONE can conclude with certainty was the change in Bank Angle in a turn at constant speed and altitude. Everything that comes after is parametric exploration for understanding of the relevance of same. I'll link this part back to the other parts after I'm done with the series for clarity. Excellent report. And good point on the fuel fraction: You can not really compare kinetic performances of a traditional fighter - which is designed to operate with external tanks - with the F-35 or Flanker (when's the last time you saw a photo of a Flanker With external tanks), which have the external tanks embedded in the fuselage. Your average fighter has a fuel fraction around 0,3 in combat configuration wheras the F-35 and Flanker is about 0,4 - a huge difference. So 50 percent "internal fuel" on a traditional fighter is much less - relatively speaking that - of,say, an F-35. A more fair comparison would be if the F-35 had perhaps 30-40 percent fuel in the same configuration. Did the math once, but don't have it at hand right now. 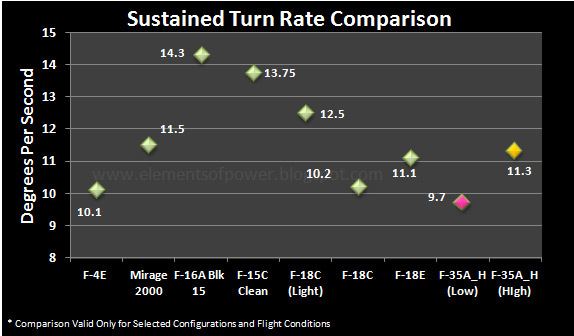 So Pierre Sprey is correct about F-35 being decisively inferior to F-16A in visual-range combat. RE: "So Pierre Sprey is correct about F-35 being decisively inferior to F-16A in visual-range combat"
"I presume the above is the kind of raw comparison that sets simple minds down the ‘F-35 can’t turn’ path. Don’t go there – you don’t know enough about what matters…yet." Assuming you can read, you saw the warning - so this means your comment is a trifling attempt to tweak the house. Pffft. BTW: The link your 'handle' takes me to your(?) website. I see a rather comical take on 'evading Air to Air Missiles'. I'm pretty sure I've read the core of it before and it didn't demonstrate sufficient knowledge of the mechanics involved then either. If you've got serious points to argue or discuss, or even offer, you are welcome. But as the record runs so far, you come off more as a link-wh*ring ignoramus trolling for attention. You get one free pass. You took it. Play nice or stick to regurgitating Center for Defense Disinformation archives at your undiscovered hole in the web. And please, for everyone's sake, learn some math and physics, will you? Your cited year 2012 DOT&E report refers to Block 2A. At Block 3C(3F) stage, G numbers are 9 / 7 /7.5. Like the F-16, F-35A obtains it's 9G. These are F-35A and F-35B Block 2B. What you are reference are the Maximum G restrictions in early blocks and planned full Max G numbers. The 'reduced G' spec controversy was over the 'Sustained G' numbers. Thanks for visiting and commenting. BTW> I'm going to finally get around to the transonic acceleration spec change pretty soon. It is a lot more interesting, from an Aerodynamics viewpoint, to just go ahead and compute the sustained load factor. You do that by multiplying the T/W ratio by the L/D ratio (which varies with speed). This eq. explains some hard to digest facts, eg how and why a fighter with a significantly lower T/W ratio (a non-afterburning subsonic type, like the HUNTER) can match the sustained performance of a high-T/W opponent. With an L/D ratio of about 10, the F-5 could out-turn the PHANTOM which possessed an L/D of about 8, despite the weaker engines (relative to its weight of course).